It was during an herbal studies class I was taking that another student suggested that the word, “tincting” well described the process of making tinctures. After considerable discussion, none of us were certain if tincting was truly a word. Somewhere in all the clutter filling my brain these days, “tincting” came flitting back as I was preparing Feverfew leaves and flowers for tincture. A quick on-line search revealed that tincting is an obsolete verb meaning to imbue or to tint with colour or to flavor. Hmmm…it appears that my friend wasn’t really too far afield using the word tincting to describe the making of tinctures. So, what does my nostalgic reminiscence of tincting have to do with the Feverfew tincture I was preparing now? Like many, my path to becoming an herbalist involved liberal amounts of self-directed education, sprinkled with a few treasured opportunities to learn from a handful of well-respected herbal masters. Sadly, my grandmother who knew and used herbal remedies, died long before I was born, so I did not have the benefit of a wise elder to pass on plant knowledge to me. Although my mother never had the same interest in herbal medicine, she did pass on the little she remembered along with my grandmother’s 1920s herbal medicine book, written in French. My path as an herbalist was established early thanks to my mother’s nominal efforts which brings me back to the art of tincting. I made my first tinctures after much reading and following the instructions listed in a correspondence course I was taking at the time. Although the instructions were fairly clear, there was no person standing next to me demonstrating just how this process was supposed to look. It didn’t seem too complicated and in many ways, it was much like cooking from a recipe. However, the nuances of the process did not translate well into print. For the first few years, I would anxiously wait for the herb plants in my garden to be ready so I could harvest what I needed all at once. After giving the plants a quick rinse, I would coarsely chop them up then stuff them into a Mason jar filled with menstruum. Most times my tincture turned out fine, although once I had a jar of Skullcap tincture with an odd smell and taste which was promptly recycled to compost. So, what was so wrong with my process? Well, it was not so much what was wrong as what was lacking. One of the most valuable lessons I learned from the herbal studies class which initiated the discussion about tincting was the fine nuances of preparing plant material-the dance of making really good plant medicine. Today, my approach to making plant medicine has become almost as much of a spiritual art as a medicine making process. 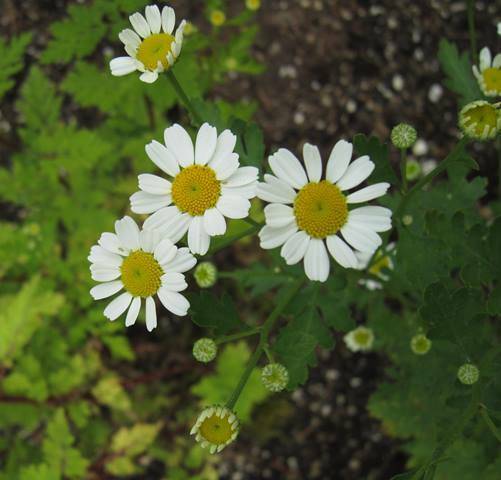 Right now, Feverfew (Tanacetum parthenium) is beginning to blossom in my garden. Although I have never had much luck using Feverfew alone to curb my migraines, I have had very good results when I combine Feverfew with other herbs such as Skullcap, St. John’s Wort and Valerian. Feverfew, a drying and warming bitter with diaphoretic, anti-inflammatory and anti-histamine properties, is useful for treating headaches, arthritis, and cold and flu symptoms. I was recently involved in a rear-end collision, and Feverfew was one of the herbs I included in the formula I made for my whiplash. Due to its emmenagogue effect, Feverfew should not be used during pregnancy. I had been watching Feverfew in the garden for several weeks, and after a few blossoms appeared, I carefully chose several stems whose flowers were just opening. After a gentle but thorough wash under running water, I patted them dry and then garbled very carefully. Garbled? Garbling is the all-important process of removing dead, yellowed, withered or bug-bitten leaves and flowers. As my mentor was fond of saying, “…if you wouldn’t consider it fit to eat in your salad, do not put it into your medicine”. Wise words, as I have no doubt that some of the off-taste from the bad Skullcap tincture resulted from my inexperience of not garbling carefully. The process of garbling and preparing plants for medicine has become almost a Zen experience for me. I no longer hurry this step, but rather lavish extra time on the plant and the process, feeling the plant’s energy and enjoying her smells and textures. After garbling comes chopping and again, I have learned the value of taking time with this step. For this I use a chef knife or my very sharp kitchen scissors, to chop or cut the plant into very small pieces. The smaller pieces provide greater exposure of the plant matter to the menstruum allowing better extraction of the plant constituents into the tincture. After the Feverfew was carefully washed, garbled and chopped, I added her to a very clean Mason jar with a cup of menstruum, labeling the jar clearly with the plant name, date and the percentage of alcohol used. For fresh plant matter, I prefer using 66% alcohol (95% alcohol diluted with water) as fresh green plants lose some of their moisture into the menstruum during tincting, diluting the alcohol content of the finished product. Some herbalists prefer to use 40 to 50% alcohol for fresh plant tinctures as they feel that certain constituents are better extracted with a lower percentage of alcohol. Other herbalists prefer using 95% alcohol. The most important part to remember is that the alcohol content of the finished extract should always be above 25% to prevent spoilage and ensure a reasonable shelf life for your herbal medicines. A well-made tincture can be expected to last at least five years, sometimes up to ten, depending on the plant material used. There are many differing opinions regarding alcohol proportions for making tinctures. Some herbalists are more exacting, weighing the amount of plant matter and adding the proper ratio of menstruum. Others, like me, follow a more folk method by adding enough menstruum to cover the plant, allowing adequate room for ‘swish’. Understanding how much menstruum was adequate for ‘swish’ was also one of those lessons I refined with the help of my mentor. Too much menstruum and your final tincture will be somewhat dilute; too little, and your plant matter will not be adequately covered and you run the risk of moldy or spoiled medicine. Like most plants, the Feverfew in my garden did not set blossoms all at once, so the amount of plant matter I initially gathered was quite small. After patiently waiting and watching, I gathered several more stems of leaves and flowers the following week which, after cleaning and garbling, was added to the first batch in the Mason jar containing one cup of menstruum. One cup of menstruum was too much for the first few plant pieces I added earlier, something I knowingly did as I planned to add more Feverfew over the next week or two. With each addition of Feverfew, extra menstruum was added, if needed, to ensure that the new plant material was well covered with enough ‘swish’ room for the plant matter to slightly swirl when the jar was shaken. If there is no movement when the jar is shaken, the plant matter too tightly packed and can spoil. When I felt satisfied that I had enough tincture brewing, I stopped adding plant matter, and allowed the tincture to ‘brew’ for four weeks from the time I last added anything, gently shaking the jar several times a day for the first few weeks. My process for making plant medicine has evolved over time from a hurried chore of quickly processing medicine to a gentle ritual of carefully preparing plants for healing and restoring the body. I think tincting reflects this gentle art of making really good medicine. It’s a good word for herbalists to reclaim. On Herb Day, May 4th of this year, the Pacific NW lost one of its beloved herbalists, Cascade Anderson Geller. Cascade was one of my first teachers and over the years, I have been fortunate to hear her speak at workshops and local gatherings. She has mentored and inspired many and her presence in the herbal community will be greatly missed. A solvent used in extracting compounds from plant.